What trends do you think will shape the future of UK plastics? How will Rockson LubriTek respond? Hydraulic injection moulding machine technology has evolved drastically over the years to improve machine energy efficiency which in turn drives the foundations for moulders to strive for improvements in production efficiency improvements. This trend will only continue to increase as regulations change and production demands increase, all while aiming for reductions in environmental impact. One potential area that is being overlooked is the performance changes that a hydraulic oil can offer, especially new formulations where advanced additives are blended to create more energy efficient, longer life, higher performing hydraulic oils. 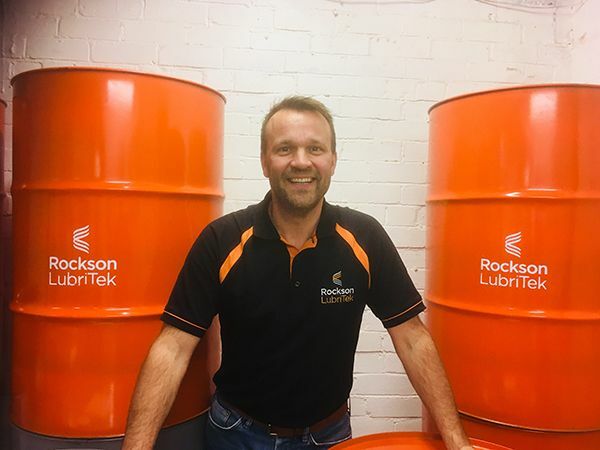 Rockson LubriTek are at the forefront of this technology, by spending time understanding what the future requirements will be and having the knowledge to supply products and services to suit, we feel that the industries needs will be met. How has Rockson LubriTek developed during your tenure? With the business just entering our 3rd year of trading, Rockson LubriTek has changed drastically from the day we started, we are constantly making improvements and looking for new ways to ensure our customers receive the best possible products and services available. Other areas that are just as important are things like branding. A lot of time and effort has gone in to making sure we’re easily recognisable. My aim is for the company name and logo to be the first things a person thinks of when it comes to injection moulding oil management. I think Rockson LubriTek has a long way to go until I can sit back and say it’s all been a success, however to get to where we have in such as short period of time is down to a blend of the usual things required to start up a new business, but also the relationships we’ve built up over many years in the industry. There are many people who’ve supported us knowing that we make every one of our customers feel they’re number 1; knowledge of the lubricants market and how to offer technical solutions into our focus industry and being slightly crazy (as any other person who’s started a business will no doubt agree)! What advice do you wish you’d had on entering the industry and does that differ from advice you would give to an apprentice joining now? The advice I had received as an apprentice was based around mechanical engineering which helped me move into technical sales which I’ve been involved with for 20 years. However, it also gave me the ability to still now be actively involved in the “hands on” approach which I feel has helped me build strong relationships with our customers. If I was to offer any advice to an apprentice nowadays it would be to embrace the opportunities that are available within the plastics industry and that gaining skills now can open many doors in future life. I learnt to juggle many years ago and once did it with knives……………but don’t ask me to repeat this! !